The American myth of settlement is founded on Plymouth Rock and Ellis Island: not St Augustine or Jamestown or New Orleans, nor the harbours of Charleston and Savannah. It is woven from stories of individuals seeking to escape the constraints of the old country, whether religious or political or economic, who offer themselves up to the new land in order that it might repay them, and if not them, the generations to follow. It tells tales of collective struggle and triumph over intense hardship. All true, but only a partial truth. For those brought up in Europe, especially those of European ancestry who remain insiders to their national historical narratives, colonialism tends to be seen through a rear-view mirror: flags lowered, anachronistically-uniformed officials taking the last salute before vacating their exquisite residences to return to the motherland and a retirement of gin and anecdotes. But the flags and the officials and the mansions were themselves a late arrival: before there was empire, there were the Companies. In 1600, as the Spanish were extracting silver from the Americas and the Portuguese navigated their way around Ottoman control of the spice trade, Queen Elizabeth set her seal to the charter that established the Governor and Company of Merchants of London trading into the East Indies, ‘for the increase of our navigation, and the advancement of our lawful traffick to the benefit of our Commonwealth’. The charter granted for fifteen years ‘the whole entire and only trade and traffick, and the whole entire and only liberty, use and privilege of trading and trafficking’ over an area that covered ‘all the islands, ports, havens, cities, creeks, towns and places of Asia and Africa, and America or any of them, beyond the cape of Bona Esperanza to the straits of Magellan’. The East India Company, as it came to be known, was the first of many European ventures granted special privileges over global trade: two years later, the VOC was founded, issuing stock that could be traded in Amsterdam by those wishing to share in its spoils. There was precedent in granting charters for one-off trade voyages or settlement expeditions, but investing in them was risky business: the Virginia Companies founded in 1606 established settlements to the north and south of the Atlantic coast of the modern-day United States, but the Popham colonists returned home after a year (when their leader, a second son, received unexpected news from a supply ship that he had inherited his father’s estate) while the Jamestown fort brought starvation and malaria to nine-tenths of its first settlers. In contrast, the broad privileges and scope granted to the East (and West) India Companies made it possible for them to hedge risk from the outset and attract ongoing investment; that investment allowed them to establish ever-more diversified and extensive trading networks, which in turn guaranteed the renewal of their charters. The Companies were exceptionally good at infrastructure. They transformed fishing harbours into cargo ports, built exchanges and warehouses, carved out roads and negotiated safe passage with local rulers. They calculated the precise number of slaves that could be crammed into ships to deliver the highest return on each passage. They presided over a fundamental reshaping of the landscape to deliver up the commodities they traded. In a sense, they were infrastructure, an embodied infrastructure: that is, transmitters of agency over great distance, a longer distance than any of the nations that granted them trading rights, an institutional power spun out like filaments over thousands of miles. Theirs was a world of routes and protocols, traffic and ports, transactions and termination points. The granting of special privileges at ports, along with exemptions from duties at home and abroad, brought with it the need to control the access of others, whether pirates or rival enterprises. To do this, the Companies gathered up multinational armies and navies that at their peak outnumbered the standing forces of any nation, and turned their trading posts into citadels: commercial disputes frequently spilled over into massacres at far-flung ports, and sometimes provoked outright war in Europe. Following decades of intermittent conflict between the English and Dutch over control of trading routes, Charles II made explicit the right of the East India Company to acquire and administer territory, make treaties and declare war on its own behalf; at the same time, he granted the Hudson’s Bay Company a trading monopoly over large expanses of the northernmost part of North America. By the end of that century, with the Dutch stadtholder sharing the English throne and Whig merchant interests dominant in Parliament, the East India Company faced its first significant challenge: despite buying the influence of peers and showering gifts upon the king, trade to India was deregulated and a rival company, made up mostly of former EIC agents, was chartered to provide competition. The shareholders of the old company took both sides of the bet, placing their spare wealth behind the new one; after a decade, the two companies merged and the ‘United’ Company was once again granted a trading monopoly in exchange for a large loan to the British government. This slow drift from trading hegemony to territorial command gathered pace in the eighteenth century, fuelled by the autonomy of agents in remote locations to act in the Company’s best interests and cultivate local political alliances, and by the doling out of trading posts in treaties settling wars fought back in Europe. Batavia remained a VOC company town, made up of segregated enclaves and run on slave labour; the EIC’s sphere of influence expanded in India as the Mughal empire waned and a patchwork of local rulers took its place, who could then be persuaded one way or another to grant ever-broader privileges to the Company. If you have an infrastructure that you’ve built up and maintained for a century, forts to defend it, and armies at your command, why not expand your sphere of influence, even if it means shooting at the locals and your rivals? And if you’re good at transactions and win a couple of battles, why not offer to collect taxes and run the government on behalf of the nominal rulers? That skirts and skims over a lot of the later history, but the larger narrative is clear. What historians call ‘Company rule’ in India may date from Plassey and Bihar and the granting of revenues to the EIC, but the Company was ruling chunks of the subcontinent for far longer, forming part of a global colonial fiefdom ruled by Companies for the benefit of their own trade. How did it end? Mostly, in mismanagement and corruption, replaced by formal empire. The VOC was liquidated by the Batavian Republic, Napoleon’s Dutch puppet state, and its possessions became the Dutch East Indies, a territory we now know as Indonesia. The rebellion against the EIC in 1857 led to the Company’s dissolution a year later, replaced by a Raj ruled from London that lasted until partition. The Hudson’s Bay Company ceded the bulk of its territorial claims to the newly-created Dominion of Canada, with the assistance of a hefty loan from Britain. 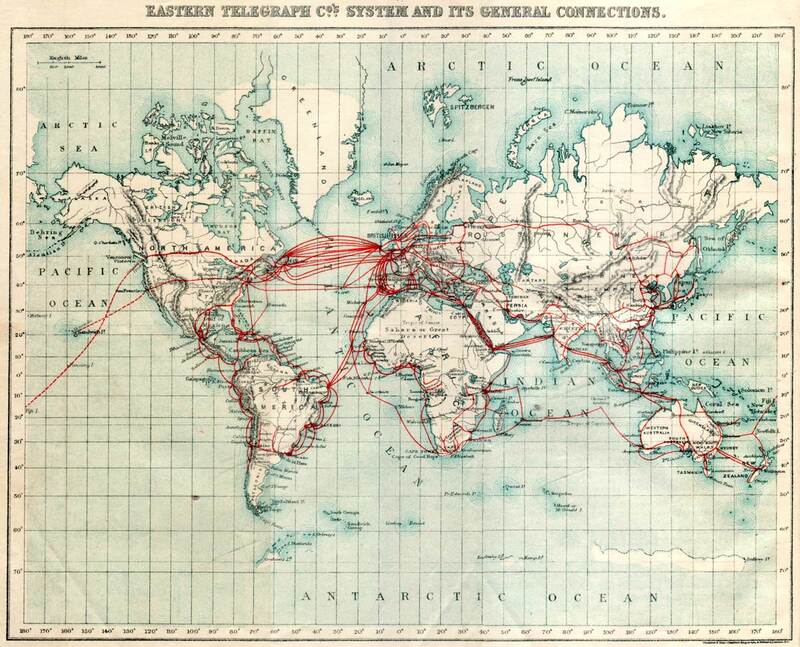 States took over Company infrastructure, assisted by a new network of their own: the electric telegraph, whose first cables were stretched across oceans, not least to keep tabs on the colonies. 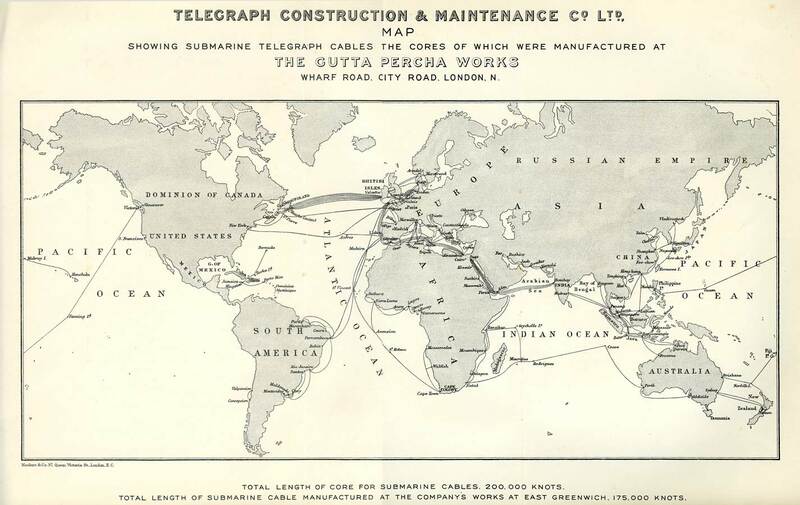 A glance at telegraph maps from the turn of the twentieth century once again shows the narrow strands of agency projected over great distance. Empire is the stumbling consequence of Company rule: a state of failure that is itself a failure, because it treats as its purpose the preservation of an existing infrastructure built for trade. That is why we should be cautious when we hear its echoes in new attempts to establish new infrastructures today. One of my favourite counterfactuals is imagining the outcome of a North American rebellion against British rule in the age of the steam ship and the telegraph; while the urge towards Canadian confederation roughly a century later was partly triggered by the civil war to the south, it feels more than coincidence that the British North America Act was passed only a handful of years after the first telegraph cable was laid across the Atlantic.